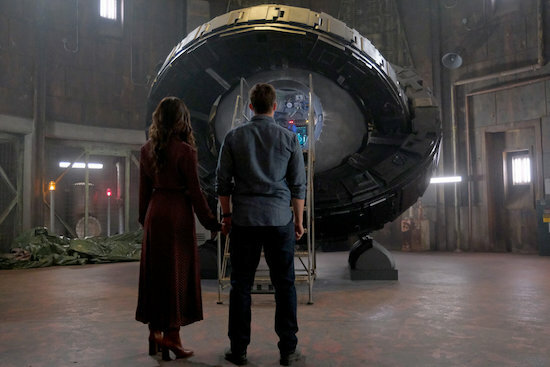 TIMELESS wrapped up its run with a television movie, and the writers were able to tie up most of the loose ends. The main triangle came to an unexpected conclusion. Though fans were split about whether Lucy (Abigail Spencer) should end up with Wyatt (Matt Lanter) or Flynn (Goran Višnjić). Ultimately, Flynn made the decision for everyone, as he opted to take on a suicide mission to save Rufus (Malcolm Barrett). The events of the finale helped clarify for Lucy that she really did love Wyatt, and wanted to be with him. In the ending flash forward, the duo were married with kids. Rufus and Jiya (Claudia Doumit) formed an adorable company. After the duo survived being trapped in different time periods and death, they formed Riya Industries (a nod to their ‘ship name), where Rufus reached out to promising student at fairs…just like Connor (Paterson Joseph) changed his life. Agent Christopher (Sakina Jaffrey) got to save the day! Prior to the script being written, Jaffrey texted the writers and asked if she’d be time traveling; at that point, they didn’t know yet. But it ended up happening—and being pivotal to saving the Time Team.